The USAID-funded SIAPS Program expanded its ongoing pharmaceutical sector strengthening interventions in Sierra Leone to include Drug and Therapeutics Committees (DTCs). DTCs were officially launched in the Connaught, Ola During Children’s, Makeni Government, and PCM hospitals at an event in March 2017 in Freetown. An additional 20 hospitals throughout the country are scheduled to implement DTCs in the coming months. Irrational medicine use and poor pharmaceutical management are widespread problems in many developing countries, including Sierra Leone, at all levels of health care but particularly in hospitals. Misuse and overuse of medicines, weak systems that compromise medicine safety, the waste of scarce resources due to expiry, and the rise of antimicrobial resistance (AMR) are particularly worrying because they directly affect health outcomes. Medicine use can be greatly improved and waste can be reduced if some simple but effective principles of medicine management are followed. DTCs, which are multidisciplinary health facility structures, are instrumental for managing the selection of medicines, evaluating medicine use, and implementing strategies to improve medicine use throughout the health institution. The DTC approach contributes to effective, safe, and cost-effective medicine use in health facilities and is also on the front line in implementing institutional strategies for rational medicine use and containing AMR. However, many developing country institutions either don’t have DTCs or aren’t able to maintain them. Sierra Leone, for example, was devastated by more than a decade of civil war and, most recently, an Ebola outbreak and is now tapping into opportunities such as DTCs to strengthen its health system. Several local newspapers, including Awoko, Premier, and the Observer, covered the event, during which USAID-SIAPS donated computers, printers, modems, projectors, and other office supplies and furniture to each hospital to help it successfully launch its DTC. USAID-SIAPS is also procuring key medicine information resources, including reference books, for current and future DTCs. USAID-SIAPS is providing technical support to hospital stakeholders to strengthen their DTC activities, such as developing terms of reference, identifying and tracking selected indicators related to rational medicine use, and improving AMR stewardship. Speaking to the technical stakeholders, hospital administrators, and staff gathered for the launch, Dr. Lebby praised SIAPS and USAID, saying the supplies will go a long way toward ensuring that DTCs function properly from the beginning. “USAID has been a valuable partner over the years and now the lessons learned will be documented with a view to strengthening the health system and a focus on patient-centered care,” he said. Mr. Bassie Turay, Director of the Directorate of Drugs and Medical Supplies and Chairman of the Pharmacy Board of Sierra Leone, also described the initiative as an important effort that will support health care providers and have a positive impact on the lives of patients throughout the country. “This is a huge milestone for the pharmaceutical system in Sierra Leone,” agreed Dr. Saad El-Din Hassan, Health Advisor for USAID-Sierra Leone. Francis (Kofi) Aboagye-Nyame, the SIAPS Program Director, and Murtada Sesay, the SIAPS Country Project Director, also spoke at the event. 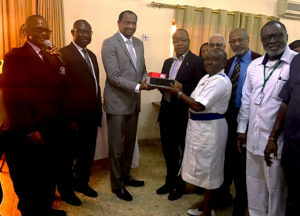 They highlighted both the collaboration and support from the Ministry of Health and Sanitation and the need to sustain the improvements being made to continue to improve the lives of patients and health care workers. The launch of DTCs in Sierra Leone follows recent successful activities by SIAPS in Democratic Republic of Congo, Ethiopia, Jordan, Mozambique, South Africa, and Swaziland, where more than 700 DTCs were created and 49 were revitalized. Click here to view a poster showcasing SIAPS’ DTC work in those countries, which was presented at the 75th International Pharmaceutical Federation World Congress in Dusseldorf, Germany (September 29–October 3, 2015).